One dispenser controls odors in areas up to 800 square feet. Accepts Micro 9000, Micro 3000 and standard Aerosol 3000 Refills. Real time (military) clock for maximum programming flexibility. Solid heavy duty ABS plastic construction. Can be programmed for 3000 or 9000 spray refills! This works as described! We live in the south, in a house that was built in 1965. Over time, the odor has increased. 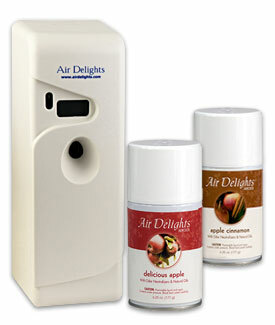 The AutoMist LCD Programmable Air Freshener Dispensers were PERFECT!!! Item 802218: The AutoMist LCD Programmable Air Freshener Dispenser was a perfect replacement for my 20+ year old air freshener dispensers. The AutoMist LCD was extremely easy to program and I'm glad it only needed one style of battery to operate. Great product and well worth the price. Item 802218: Performs as advertised. Thank you!